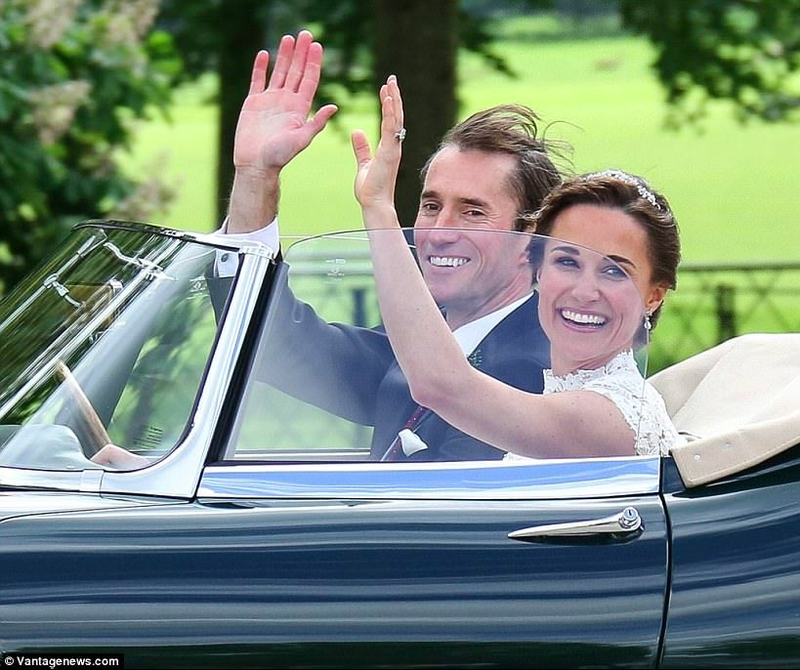 She may not be an official member of the British royal family like her elder sister Kate, Duchess of Cambridge and wife to Wills, but Pippa Middleton was every bit a princess bride for her fairy tale wedding to James Matthews in Berkshire, England over the weekend. From her elegant custom-made wedding gown to the high-society guest list to the lavish dinner and reception, Pippa proved she didn’t need to be royalty to have a wedding fit for a queen. Pippa took a page from her sister’s wedding book and commissioned a custom gown for the big day. Following in the fashionable footsteps of Kate’s now-famous Alexander McQueen dress by designer Sarah Burton, Pippa looked classic, elegant, and contemporary all at once in her custom lace gown by British designer Giles Deacon. The designer was a bold choice—he’s best known for his “eccentric” fashion designs, as outlined in this article by Vanessa Friedman for The New York Times. 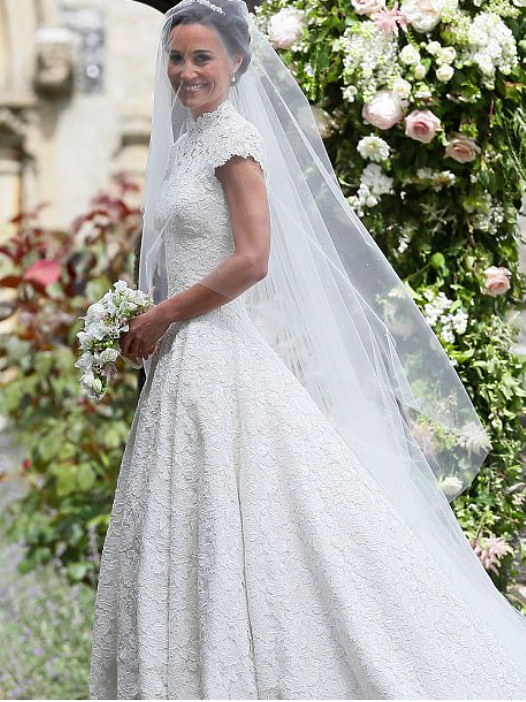 Pippa’s gown puts Deacon in the same league as other great couture-slash-bridal designers such as Carolina Herrera and Oscar de la Renta. Could he be the next big thing in bridal fashion? Time will tell. But one thing’s for certain: there’s sure to be a slew of Pippa-inspired gowns on the runway at next October’s Bridal Market in NYC. For now, get the look with one of these similar regal styles. And while we loved the gown’s high neckline and heart-shaped back, we have to confess we didn’t love those little lace caps sleeves. Even with Pippa’s amazingly toned arms—the likes of which we haven’t envied since Michelle Obama’s—a cap sleeve can be terribly unflattering; full-length sleeves are much more appealing, in our opinion (see the Duchess’s long-sleeved dress for proof). Still, Pippa’s choice of frock was pretty much perfection given her church nuptials and society affair. 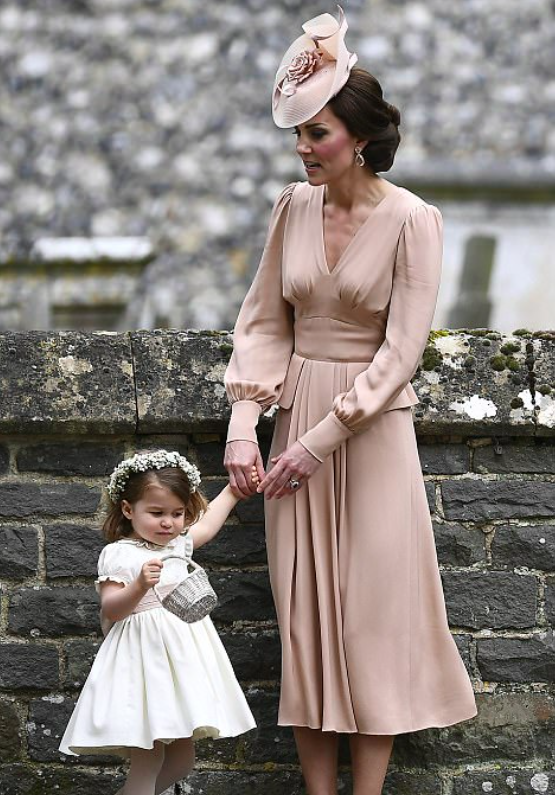 Pippa chose not to have a traditional bridal party, but she did include a gaggle of darling kiddos in the big day, including her niece and nephew, Princess Charlotte and Prince George, who served as a petite bridesmaid and a pageboy, respectively. Does it get any more adorable than little girls dressed in smocked frocks and flower crowns and little boys dressed in white shirts and silk knickerbockers? You can thank Spanish label Pepa & Co—not to be confused with Pippa—for outfitting the flock of littles in their wedding-day finery. Like the bride’s gown, the miniature outfits were all custom made, but you can find similar styles on the company’s website. The Duchess of Cambridge was tasked with keeping the wee ones in order and well behaved—not exactly an easy job, as evidenced by this viral photo from the big day. But Kate kept her cool and looked flawless throughout it all, dressed in a blush-hued Alexander McQueen dress—the same shade as the sashes on the little bridesmaid dresses. While Pippa’s showstopping 3.5 carat Asscher-cut diamond engagement ring and simple gold band certainly qualify as her “something new,” the bride opted for “something old” for her wedding-day earrings. Her pear-cut diamond drops are the same earrings she wore for her elder sister Kate’s wedding—a nod to that monumental day and the Middleton family. Find similar crown-worthy jewels at Ben Bridge or Kassab Jewelers. Pippa spared no expense when it came to the floral arrangements she chose for her wedding day. While her bouquet was relatively small—a far cry from the lush, oversized bouquets that are popular across the pond here in the States—her ceremony was in full bloom with English garden greenery and pretty pink and white blossoms, including roses, peonies, sweet peas, and freesia. Inside the church, flowers climbed up the stone archways and decorated the stained-glass windowsills. 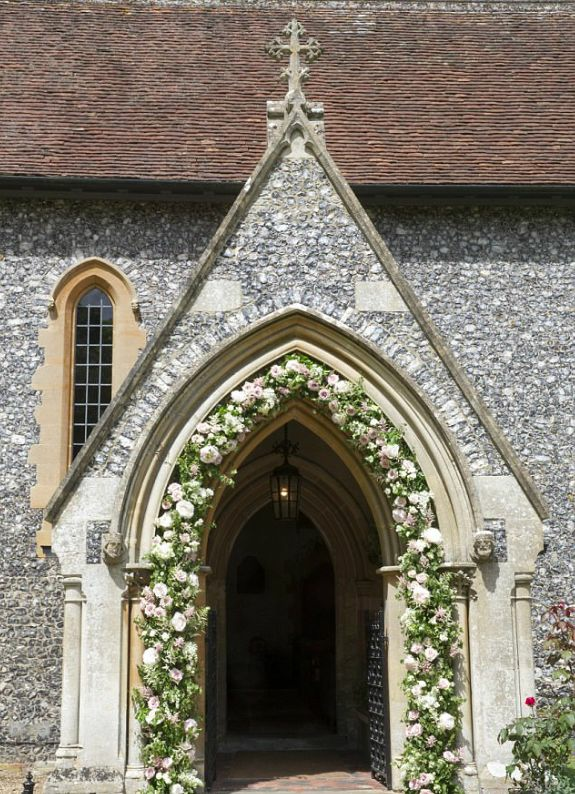 We love the romantic, flower archway the couple paused under for a kiss as they exited the church. 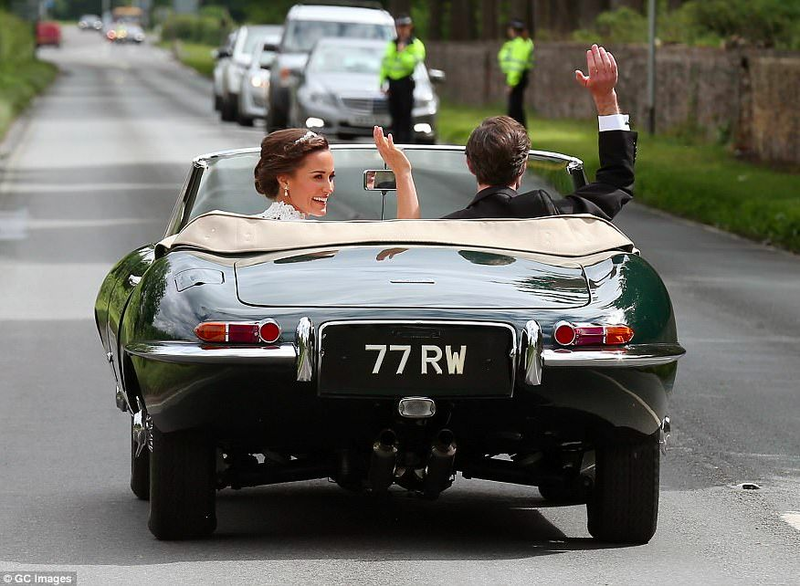 Following their ceremony at St. Mark’s Church, the newlyweds drove off in a vintage convertible Jaguar (classy AF). For a similar posh getaway, check out the selection of vintage cars at Best Car in Town or Classic Chauffeur. 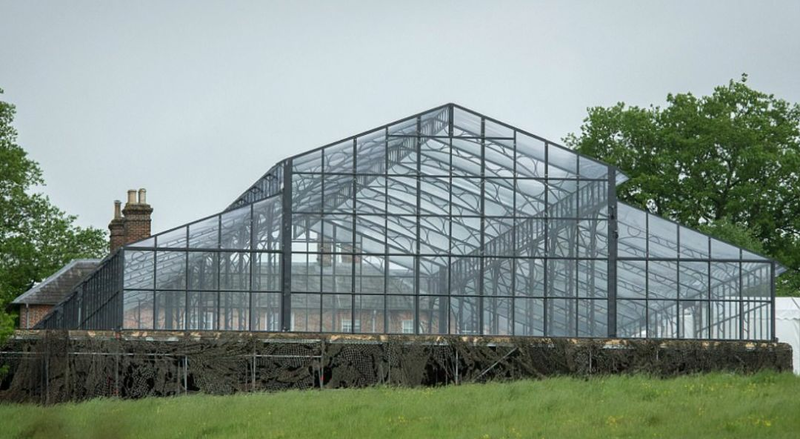 For the couple’s lavish, black-tie reception, Pippa and James erected a glass marquee on the property of her family’s Berkshire mansion. The grand structure was filled with more beautiful flowers and colorful lights to create a party-like atmosphere. Guests dined on caviar, drank Champagne, and enjoyed video footage of the happy couple beamed on the back of the Middleton home, before dancing the night away. While a glass marquee may be hard to come by in our neck of the woods, Barclay Event Rentals has a tip-top selection of tents in various shapes and sizes, including a large canopy tent that offers a similar look to Pippa’s glass marquee.